Rovio's Angry Birds might be getting a whole lot more vicious if a new controller ever makes its way to market. 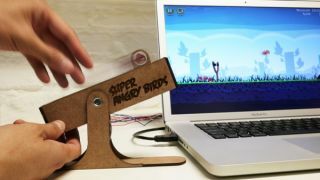 Andrew Spitz and Hideaki Matsui, two intrepid graduate students at the Copenhagen Institute of Interactive Design, pulled back the curtain Saturday on their latest project, a USB slingshot controller for Angry Birds they're calling Super Angry Birds. The force feedback peripheral interprets the distance pulled back by the player and the angle, then translates that information through a motorized fader (yes, like on a DJ's high-end mixer) to a micro-controller. Processing tables, which interpret the input and translate the data into a correlative avian fling, and a separate plunger peripheral controls the activation of special birds' abilities. For those getting their hopes up about this peripheral hitting the market anytime soon, think again. As this is still a school project, the "brains" of the controller remain external to the device, and the prototype is the only of its kind. "We definitely play in the exploration/prototyping realm," Spitz said. "And hopefully [others] can make these ideas into reality." Rovio has not stepped forward to take umbrage with or ownership of the device design. The project was originally a study in Haptics, or tactile feedback technology. The most common example of haptics in gaming is the rumble feature. This slingshot represents not only a charming way to play Angry Birds on a computer, but also a conceptual leap towards more tangible peripherals for games. Again, this is just a prototype, so this is no market shift. Instead, it's a proof of concept that falls right in line with id Software's virtual reality frontier. Spitz and Matsui both have backgrounds in sound and interactive hardware design and are responsible for over twenty different pieces of innovative hardware ranging from Audible Color to Blind Maps for the iPhone.